If you hold the strings of a guitar very strong - string breaks. If weakened to the limit - the chord will not make melodic sound. The guitar will be silent. I raise my glass to the fact that your life gave you new beautiful melodies every day! Thankyou Yervant, an honor to have you refer to me as friend. On June 7, AGBU Europe launched an appeal calling on the European Union and European aid organizations to engage with the population of Nagorno-Karabakh. “Nagorno-Karabakh (NKR) is a landlocked mountainous territory in the South Caucasus, home to 150,000 people. It is one of the several unrecognized states that emerged from the breakup of the Soviet Union in 1991, and the Republic of Azerbaijan claims sovereignty over NKR. It is one of the most impoverished areas in the periphery,” reads the text of the petition on Change.org. “The inhabitants of this small unrecognized state have been under continuous threat of war and isolation for more than 20 years, which has caused considerable hardship. A blockade continues to impact the daily life of the people, who also suffer from the highest mine-related casualty rate in the world,” it says. The EU does not provide direct aid to the people of Nagorno-Karabakh, in contrast to other territories under dispute, such as Northern Cyprus, Abkhazia or Transnistria, which have received substantial benefits from EU engagement and aid. “We call on all those who believe in Europe to sign onto this appeal. We stand ready to work with European institutions as well as with international NGOs to find ways to respond to the needs of the civilian population in Nagorno-Karabakh,” says Nadia Gortzounian, President of AGBU Europe. Despite the isolation and economic hardship, Nagorno-Karabakh focuses on the development of democracy. It is making considerable efforts to improve institutions and strengthen civil society. AGBU Europe has published a video and information package aimed at explaining the case for EU engagement in NKR. 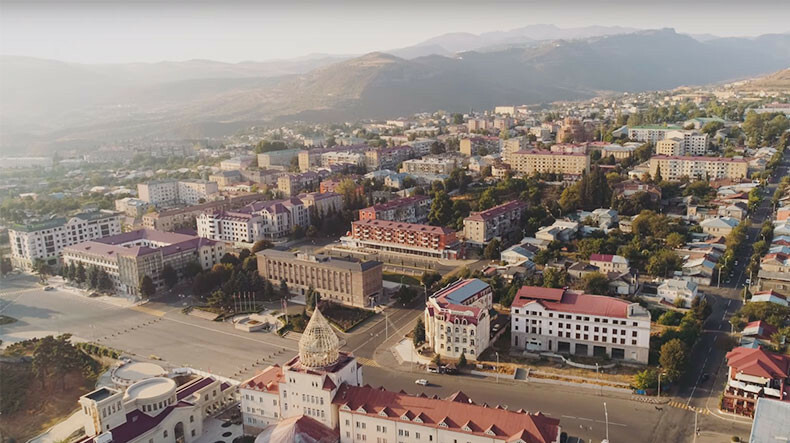 Latvian blogger Alexander Alimov has presented the trailer of a documentary about Nagorno-Karabakh (Artsakh) on TravelBlog.lv, strongly recommending everyone to pay a visit to the country. The full film will be released online on 10 January 2018. “In my turn I want to add that if you ever have the opportunity to visit Nagorno-Karbakh, don't hesitate a moment. Believe me, you will return home as a completely different person. Pleasant viewing and see you in Nagorno-Karbakh,” the blogger wrote. Long live people of Artsakh! Beautiful lady. Karabakh is famous not only for its beautiful nature, ancient monuments, fertile land, but also for long-livers. As of February 2018, there are 16 people aged over 100 in Nagorno-Karabakh. The oldest woman, Arevhat Sargsyan, 110, lives in the village of Tagavard. Correspondents of Armenian News - NEWS.am visited her (PHOTOS). By the time of our arrival grandma Arevhat was not at home. But soon we saw a fragile woman with a dark headscarf and apron. Long years of hard life left their mark on her, but did not change one thing - her radiant, joyful smile. Talking with grandma Arevhat is pleasant , but not easy. The Karabakh dialect, which is not easy to understand, is generously flavored with local words and expressions. I tried to delicately ask the grandmother about her life, but after ten minutes I took a break and asked for a "translator". With the help of her daughter-in-law Stella it turns out that grandma Arevhat is turning 110 on July 1. Her long life was difficult, hard, full of achievements and losses. 17-year-old Arevhat got married to widower Lazar, the father of five children. Young Arevhat gave birth to the first child, but after a while Lazar died. Arevhat did not abandon her husband's children. A few years later, Arevhat got married for the second time again to the widower, with six children. Then the couple had three children. After the death of her second husband, Arevhat brought up 15 children. Arevhat has worked as a nurse in hospital for many years. Telling about her life, grandma Arevhat repeated many times "I never lived, but suffered". Arevhat has outlived some of her children. Asked, how many grandchildren and great-grandchildren Arevhat has, Stella answered: "More than a hundred." It turns out that grandma likes coffee and good wine. In general, according to the family members, she eats mostly vegetables, does not like meat and sausages. "Eat a lot of fruit, apples and plums, dried fruits, it is useful for health," the grandma Arevhat advises. Because of poor eyesight, she is not able to knit or sewbut she actively does everything possible at home and in the garden. On our way to Stepanakert each of us was thinking about the meeting with the grandmother of Arevhat. World War I, World War II, conquest of space - grandmother Arevat became the witness of a whole century.